Background: This study in Mobile Bay was part of the Gulf of Mexico Regional Collaborative (GoMRC) project which was established with NASA funding to provide a practical, flexible toolset for regional scale analysis and decision support for sustainable management of the Gulf of Mexico coastal areas. Mobile Bay is an inlet of the Gulf of Mexico, lying within the state of Alabama in the United States. The Mobile River and Tensaw River empty into the northern end of the bay, making it an estuary. Mobile Bay is the fourth largest estuary in the United States with a discharge of 62,000�cubic feet (1,800�m�) of water per second. Mobile Bay is 413�square miles (1,070�km�) in area with an average depth of 10�feet (3�m) (Dauphin Island Sea Lab, 2008). Species diversity and a wide range of habitats are found in Mobile Bay. Habitat types include soft sediments, seagrass beds, barrier island dune and inter-dune wetland swales, fresh and saltwater marshes, pitcher plant bogs, bottomland hardwood forests, wet pine savannas, and upland pine-oak forests. Soft sediment habitats are an important food source for species critical to the local economy such as shrimp, oysters, and flounder. Vegetated bottoms are one of the Gulf coasts most important ecosystems. Submerged aquatic vegetation (SAV) is linked to the estuarine food chain and is a vital food resource (Borum, 1979). SAV habitats also provide coverage for breeding and foraging of important marine and estuarine species (Stout,1998). Two of the major stressors that result in habitat loss are population growth, land use change and surface water runoff (Mobile Bay NEP, 2008). Land areas surrounding Mobile Bay, including the City of Mobile, beach areas, and the Bay�s eastern shore have been experiencing significant urbanization over the last decade as has many other areas along the Gulf coast. Consequently, the diversity of habitat and LCLU change environment makes Mobile Bay an attractive study site. 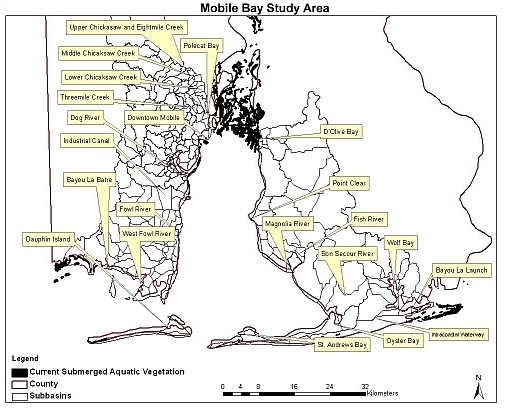 The aquatic ecosystems in Mobile Bay and other areas of the Gulf coast are sensitive to the impacts of land use change. These impacts add stress to the environment by increasing freshwater flows that create greater fluxes in the temperature, salinity and turbidity of the marine environment. Coastal resource managers are interested in data on these critical variables that affect the health of seagrasses and SAV in Gulf ecosystems. Hypothesis: Urbanization will significantly increase surface flows and impact salinity and temperature variables that effect seagrasses and SAVs. How much will urbanization change flows, salinity and temperature within Mobile Bay? 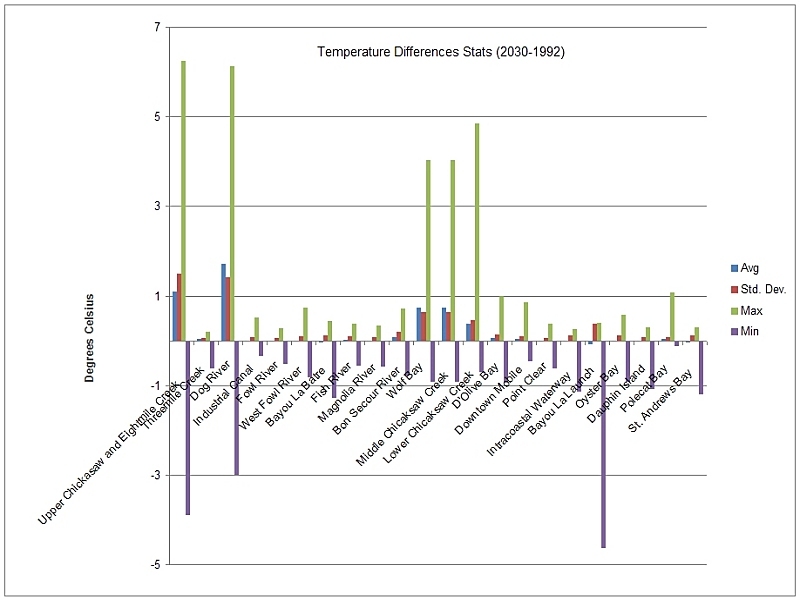 How important are increased fluctuations in temperature and salinity as a seagrass/SAV stressor? 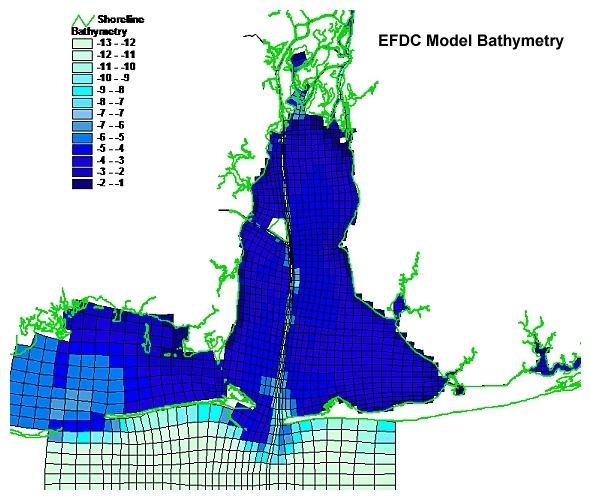 Watershed and hydrodynamic modeling has been performed for Mobile Bay to evaluate the impact of LCLU change in Mobile and Baldwin counties on the aquatic ecosystem. Watershed modeling using the Loading Simulation Package in C++ (LSPC) was performed for all watersheds contiguous to Mobile Bay for land use Scenarios in 1948, 1992, 2001, and 2030. The Prescott Spatial Growth Model (PSGM) was used to project the 2030 land use scenario based on observed trends. All land use scenarios were developed to a common land classification system developed by merging the 1992 and 2001 National Land Cover Data (NLCD). The LSPC model output provides changes in flow, temperature, and general water quality for 22 discharge points into the Bay. Theses results were inputted in the Environmental Fluid Dynamics Computer Code (EFDC) hydrodynamic model to generate data on changes in temperature and salinity values on a grid with four vertical profiles throughout the Bay�s aquatic ecosystems. 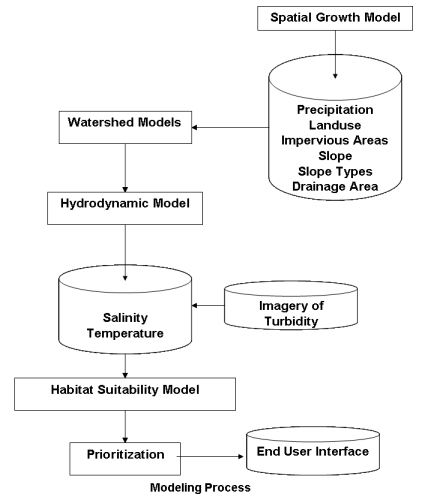 Outputs from the hydrodynamic model are used as inputs for the habitat suitability model for each land use scenario. 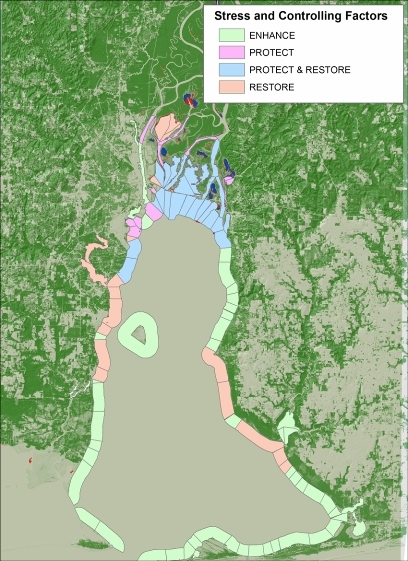 The habitat suitability model is used to predict potential shifts of shallow water habitats over time, thus identifying areas of resilience or marginalization, and areas for protection, restoration or conservation measures. PSGM is an Arc geographic information system (GIS) compatible application that allocates future growth into available land based on user-defined parameters. Inputs to the model are current land use and current projected population, employment, and road networks. LSPC is a watershed model in C++ that has algorithms for simulating hydrology, sediment, and general water quality. Land use and weather text files are major inputs to drive the model. EFDC is a hydrodynamic model that can be used to simulate salinity and temperature in aquatic systems. Finite-volume finite difference solution scheme to solve 3-D vertically hydrostatic equations of motion. The habitat suitability model is a GIS model that is based on known factors limiting seagrasses/SAV growth such as salinity, temperature, and available light. These inputs are combined in a simple map algebra subroutine for a scored grid of habitat suitability for seagrasses/SAV. 1992 and 2001 Landsat derived National Land Cover Data (NLCD) were used for Mobile and Baldwin Counties to determine recent historical trends and to serve as baseline land use input data for spatial growth modeling and as inputs in watershed and hydrodynamic models. 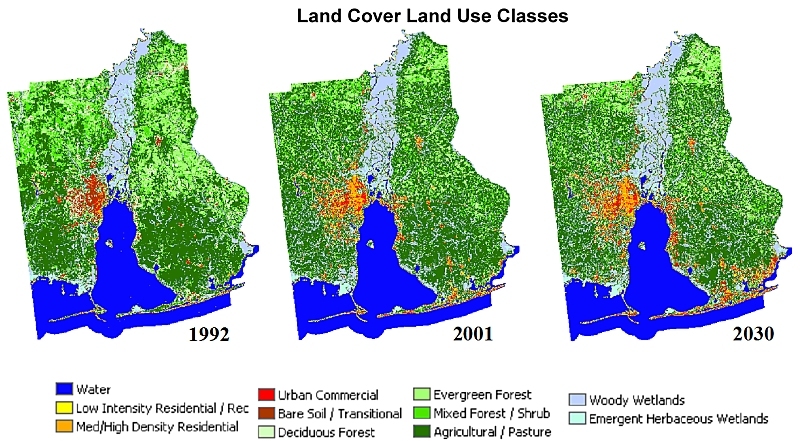 A remapping of the 1992 and 2001 NLCD classes to a common classification scheme allows comparison for 1992 to 2001 period and future land use projection scenarios. Classes in light blue did not exist in both 1992 and 2001 NLCD classifications. The third column shows the remapped class names and groupings from the original LCLU classifications. 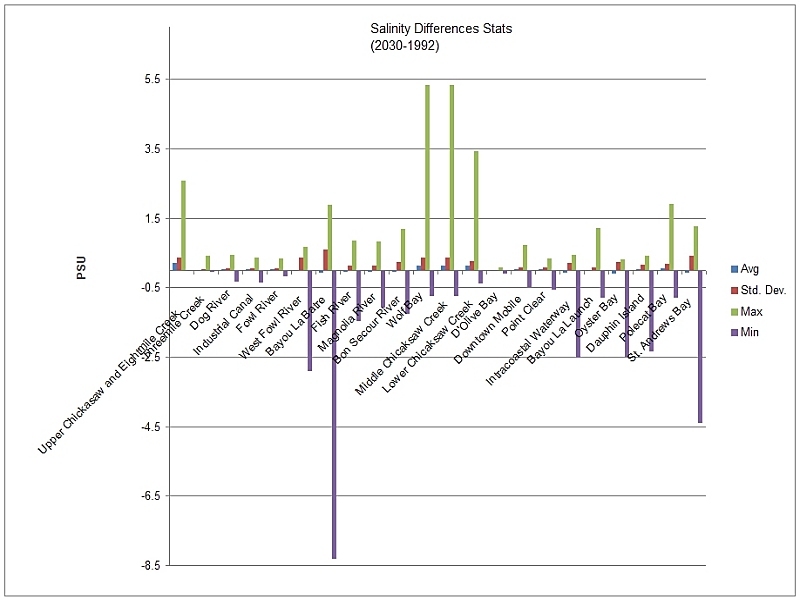 A LCLU trends analysis was used to calibrate the Prescott Spatial Growth Model. The changes in the aquatic ecosystem were used to perform an ecological analysis to evaluate the impact of temperature and salinity changes due to LCLU change on sea grasses and Submerged Aquatic Vegetation (SAV) habitat. This is the key product benefiting the Mobile Bay coastal resource managers that integrates the influences of temperature and salinity due to land use driven flow changes with the restoration potential of SAVs. 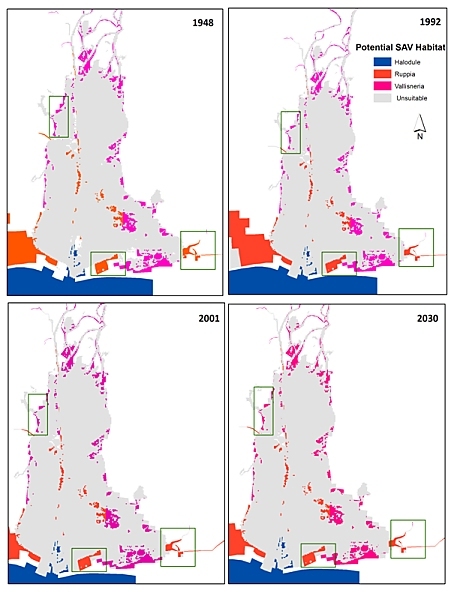 This helps to predict potential shifts of shallow water habitats over time, thus identifying areas of resilience or marginalization, and areas that need protection, restoration or conservation measures. LCLU changes are increasing freshwater flows into Mobile Bay. 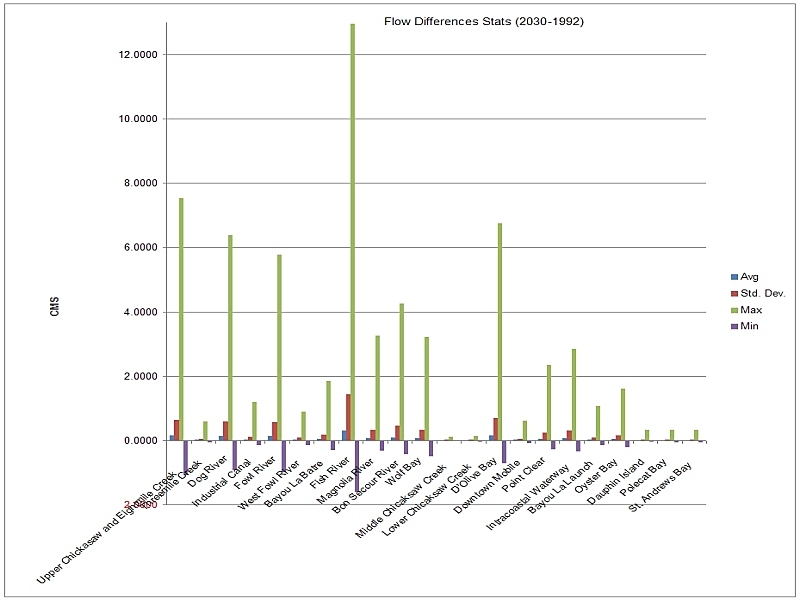 These increasing freshwater flows are causing increased temperature and salinity fluctuations. Seagrasses and SAVs have significantly decreased in Mobile Bay over the past 60 years and are being stressed by increasing urbanization. The impact of sediments and turbidity due to land use driven flow changes and climate variability will be investigated in future work.